Apache Solr is a fast, open source, enterprise search platform, the working of this application is simple, you place your documents via any of the tool like JSON, XML, CSV or binary over HTTP and then you can query those documents via famous HTTP GET method and as a result, solar returns you search results in almost real time manner. Solr is gaining popularity, it has large set of features and developers all around the world are using this technology to cater the search needs of their applications. Here are some of the important features of this application. It uses lucene for advance level full search capabilities. It is optimized and tested to run fine on high traffic sites. Solr adopts the tools you use to make application building a piece of cake. Solar comes with built-in comprehensive administration guide for easy management of instances. Solr applications are easy to monitor and manage. Built on Apache Zookeeper, it is highly Scalable and fault tolerant. It has extensible plugin base, so in this way you can extend the functionality of Solr project. Let’s see how we can install this beautiful software on ubuntu linux 15.04. Solr is java based, so in order to run it, we need to install Java first, launch your terminal window and run following command to install java. Sit tight, it might take upto few minutes to download and install java on your ubuntu system. 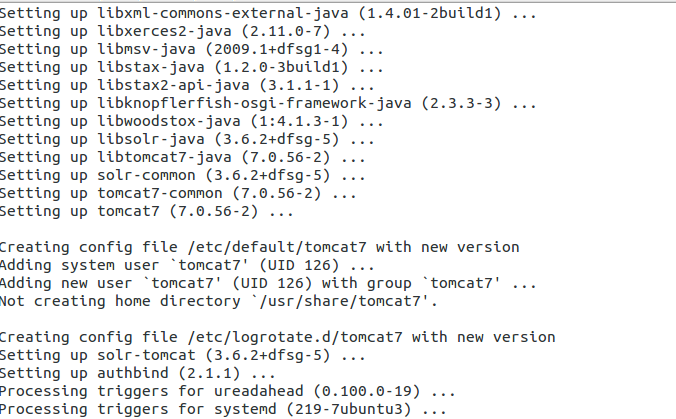 Solr needs Tomcat as well, run following command on your terminal and it should take care of installing both tomcat and solr for you. Now start tomcat service by running the following command. Now, let’s test our installation to ensure its working fine. Launch your browser and load http://localhost:8080, in case of successful install, it should load tomcat welcome page as shown in the following screenshot. Now point your browser to http://localhost:8080/solr and it should load solr administration page.